“The customer is always right” has been taken to an extreme with the evolution of e-commerce and the digital retail landscape. Consumers have ideas of what they expect from online shopping, and retailers, suppliers, 3PLs and all the other trading partners in between are doing all they can to make shoppers happy. And who is setting the bar for consumer expectations? One word: Amazon. More than 500 retailers, suppliers, distributors and logistics firms recently weighed in on the biggest factors impacting consumers’ buying decisions. That information was compiled through a survey SPS Commerce commissioned from Retail Systems Research (RSR). The survey answers the respondents gave pointed distinctly in Amazon’s direction as a driver of consumer expectations. Across the retail landscape, survey respondents report that the price of goods is still the top factor impacting customer buying decisions. About 68 percent agreed that online shoppers are looking for the best price. Amazon has likely had a big impact on setting such consumer expectations, as its marketplace has made it incredibly easy to compare prices. Product availability came in second, with about 54 percent of respondents citing it as a major factor in buying decisions. If an e-commerce site has the right item in stock and the price is right, there is a better chance that the customer will buy it. However, after price and product availability, there’s some disagreement on what consumers want. At 36 percent, little more than a third of survey respondents said product assortment is a major factor for buying decisions. These organizations may have caught on to how fickle online consumers are. Recall the top buying decision factor of pricing and think about how that applies to shipping charges. If an e-commerce site doesn’t provide all of the products that the customer wants to buy, they’re more likely to go to a different site to get what they want from a single provider, rather than pay shipping charges for two orders from two different sellers. Coming in fourth on the list with 28 percent is product information. When it comes to e-commerce purchases, the product details can make or break the sale. The last thing a consumer wants to do is figure out how to return an item to an online retailer (and the last thing the retailer wants is to refund the sale). Full-color, detailed photos and accurate, in-depth product information tell customers exactly what they’re ordering, giving them more confidence to buy. User ratings and reviews like those offered by Amazon can also be helpful for shoppers to make online buying decisions. 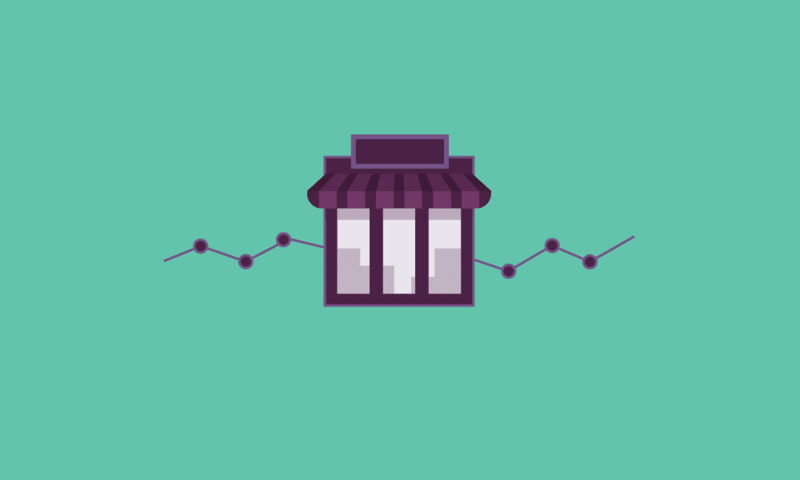 About 25 percent of survey respondents listed ratings and reviews as having a big impact on whether or not a customer buys a product from the particular merchant. Not only do they give insight on what to expect when the product arrives, it can also tell them whether or not the retailer can reliably deliver on expectations. One difference worth noting in the results is how different players in the retail industry viewed shipping price and speed. 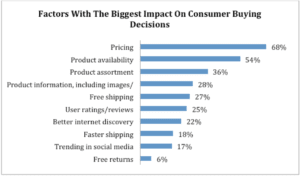 Though free shipping was selected as a decision factor by 27 percent of respondents overall, 42 percent of retailers listed it as a major factor, as compared 24 percent of distributors and 23 percent of manufacturers/suppliers. 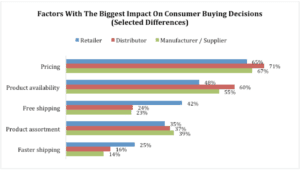 Similarly, though fast shipping was indicated as a buying factor by 18 percent of respondents overall, 25 percent of retailers listed it as a major factor, as compared 16 percent of distributors and 14 percent of manufacturers/suppliers. Retailers are probably more keenly aware of Amazon as a competitor, and Amazon’s shipping options could be playing a big part in setting these speed and price-related consumer expectations. First, Amazon offers two day shipping on a huge assortment of items, meaning customers know they won’t have to wait long to receive their orders. Second, with Amazon Prime many shipping options are free after the enrollment fee has been paid. Modern consumers love the convenience of having items delivered as opposed to getting them from the store, and as long as it’s fast and cheap, it’s a choice they’ll make over and over. Other retailers would be wise to figure out how to address the shipping demands of online consumers. In our fifth year doing the benchmark survey, one theme endures, year over year: Consumers are setting expectations in retailing. We anticipate that this trend will continue and accelerate in coming years, led in part by Amazon. Even so, there are other marketplaces and players on the field that emerge to yet again transform consumer buying behavior. The companies that learn how to adapt and anticipate in the omnichannel era will have the greatest chance at success. Since 2011, SPS Commerce has teamed with Retail Systems Research (RSR) to annually survey hundreds of retailers, suppliers, distributors and logistics firms to understand their outlook and strategic focus for the coming year. Download the complimentary research report to see how your 2017 plans compare with your peers. And, if you’re looking to move quickly on your 2017 initiatives, contact SPS Commerce to help. Are you on Amazon Marketplace? The SPS Amazon Integration solution can help you increase efficiencies to sell more product and track inventory, while turning the data into actionable insights.